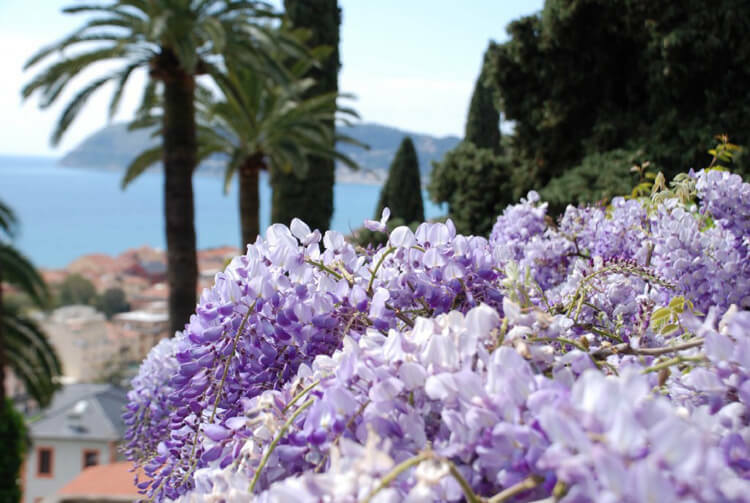 Italy boasts a large number of fabulous gardens filled with flowers and plants that, comes spring, explode into a myriad of colors and scents. It is the best time to take a walk around these gardens, while enjoying the warmth of the spring sun, awakening to the new season just like plants do. Many gardens also organize special events during the spring season. Here are some of our favorite Italian gardens. A classic when it comes to Italian gardens, Villa Carlotta never fails to impress. Set in a natural basin between lake and mountains, Villa Carlotta, built at the end of the 1600s, is just as famous for its botanical garden as it is for its impressive rooms filled with artistic masterpieces, which include works by Canova. The property extends over 17 acres in Tremezzo, facing the Bellagio peninsula and features a splendid Italian-style garden, with staircases, fountains and sculptures. In the spring, azaleas in more than 150 varieties produce a remarkable show: the variety of colors, the dimensions reached by the shrubs, the background of centenarian rhododendrons in full bloom make for an amazing sight. 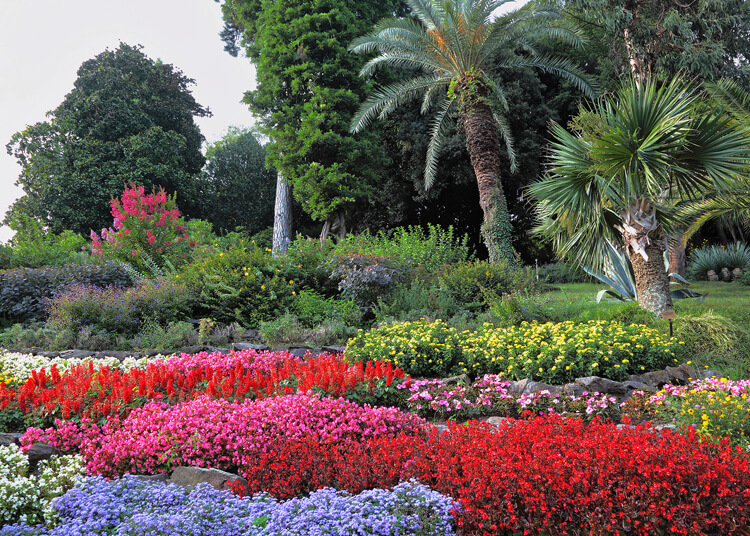 You can also admire camellias, cedar and redwood trees, plane trees and exotic plants. A noble 16th-century residence, with frescoed rooms painted by major artists of the Renaissance, Villa Pisani Bolognesi Scalabrin was embellished with a garden and romantic park in the 19th-century, thanks to countess Evelina van Millingen Pisani, who also made the villa a gathering point for illustrious figures, including royals and many Anglo-Saxon intellectuals, like Henry James. 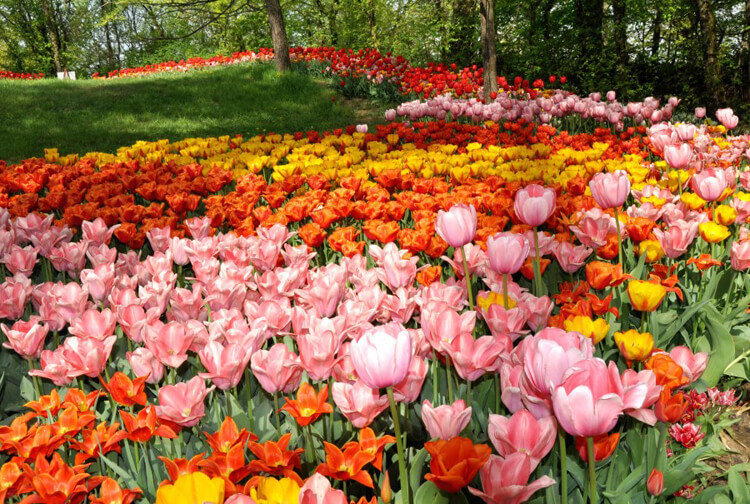 In the spring, 60,000 tulips bloom among wild flowers. Just imagine the show! The tulips are celebrated throughout April with the ‘Evelina’s bulbs’ event. After a long period of neglect, Villa della Pergola was restored in 2012 and brought back to its Victorian charm, complete with 22,000 square meters of parkland in their original 19th-century English garden style. A stroll through Villa Pergola will take you among pergolas covered with yellow roses, among wisteria and bougainvillea, pine, carob, olive trees and holly oaks, mixed with plants from around the world: Australian eucalyptus trees, banana trees, palms, aloe, agave and more. Look out for the blooming of the wisteria: there are more than 28 varieties of flowers which range in color from white to pink, to purple, blue and other shades. Villa della Pergola also boasts a unique collection of agapanthus, with more than 350 varieties of “African lilies,” as these flowers originating in South Africa are called. They have the color of the sea, and you can actually admire the Ligurian Sea from the large terrace of the villa which overlooks the Gulf of Alassio. 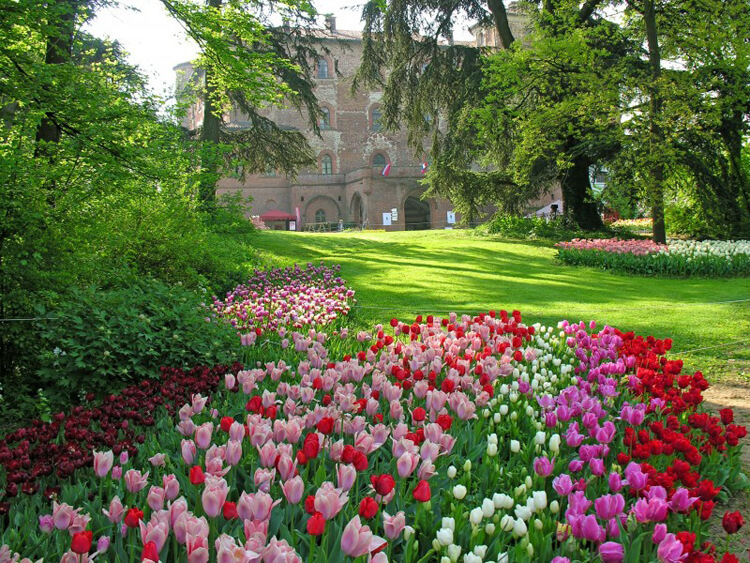 90,000 tulips in bloom transform this castle in the Roero area of Piedmont into an enchanted garden. Tulips are indeed at the center of an event that begins April 1, “Messer Tulipano”; visitors can also admire blooming daffodils, a rare collection of black tulips, and walk through the undergrowth where parrot tulips, lily tulips and other varieties can be seen. During the event, which continues until May 1, you can also discover a secret collection of natural bonsai; an aromatic herbs garden in the shape of a heart; and use a large loom to weave among tulips. For real enthusiasts, there is also a shopping area with flowers, plants, garden equipment, and curious objects inspired by the natural world. If you want to spend the night, you can opt for one of the five rural suites, set up in the perimeter of the park, each dedicated to ancient crafts: the lumberjack, the gardener, the herbalist, and so forth. The spring season begins on April 1 at Castel Trauttmansdorff as more than 300,000 flower buds begin to blossom in every corner of the garden, among them tulips, daffodils, buttercups, forget-me-not, Iceland poppies... Trees also abound: exotic camellias, Japanese cherry trees, beautiful rhododendrons, elegant peonies. The garden of the castle, one of the most visited tourist destinations in South Tyrol, features 12 hectares dedicated to plants from all over the world, with 7 km of trails. Even summer is blooming season at Castel Trauttmansdorff, with English roses and Mediterranean plants such as oleander and Constantinople acacias; fragrant lavender bushes bloom in June, while exotic water lilies and lotus flowers adorn the waters of the castle’s pond. The Areas of Tuscany That Inspired "Cucina Tipica: An Italian Adventure"